Thanks. I may have a micro SD I can use with an adapter. Or just transfer the content of one to a PC and put it back when I'm done. Looks like I won't be able to avoid that. So, people have been giving it poor reviews because they think it's...what? A platformer? Why is it controversial that ZombiU is survival horror? 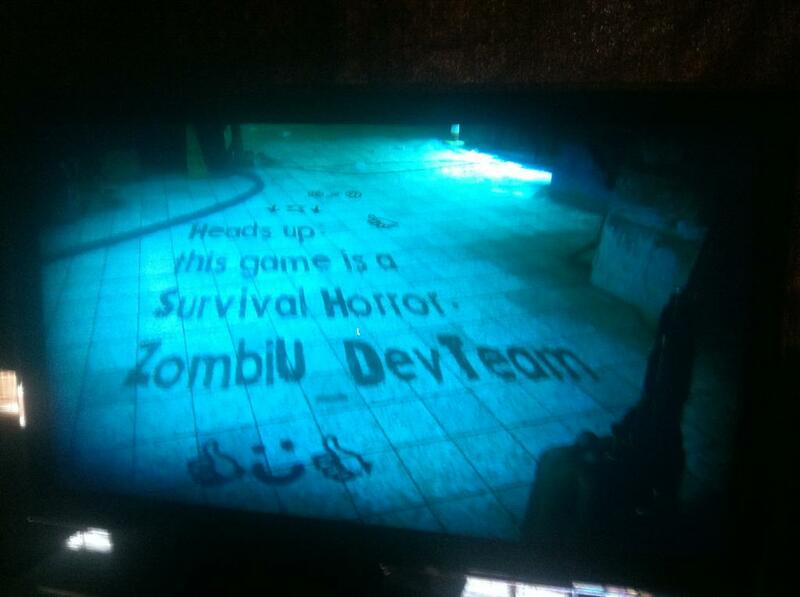 I think it's more of the fact that they are proud of it ....you know, rather than some other developers. I went to walmart on my lunch hour and i was extremely surprised that they had multiple Wii-Us in stock. Nintendo evidently had alot to supply or it isn't selling that great. I don't know what you're referencing here. Also, I don't know why a company being proud of making survival horror would result in poor reviews. A lot of the reviews give the impression that they were saddened that it wasn't more of an action game. They mention the shortage of ammo, having to take your time and this and that. Some reviews even praise the multiplayer since you have unlimited ammo and can just mow down zombies, something you don't have and can't do in the main game. A lot of them just come across like they just don't get the point. I'm not saying it's a good game either way, just that is what it seems to be to me. Something is surely going on since it seems those that are going into it expecting what it was meant to be are giving it great reviews, for the most part. The recent horror games like Dead Space and latter-day Resident Evil would probably be considered action games with a horror atmosphere rather than true survival horror where inventory is actually limited and dying has real consequences. I mean, as great a game as RE4 is, I was hardly ever in a resource-depleted position and I'm at best an average gamer. I think it's possible some folks who are used to these games might find the more pure survival horror experience a little too punishing and therefore, not very fun. So how about people who've actually played it? Is it good? Now, there may be other problems with the game but I was under the impression that this was more "Dead Souls" than "Dead Island". Apparently, that's striking the wrong chord in some players. Last edited by Groucho; 11-19-12 at 04:40 PM. Now, there may be other problems with the game but I was under the impression that this was more "Dead Souls" than "Dead Island". Apparently, that's striking the wrong cord in some players. That's a good way to put it, yeah. If you go into it not expecting a difficult, true survivor horror experience, then you're gonna have a bad time. This isn't a run and gun shooter with horror elements. It's a survivor horror game in which the goal is to simply survive, and to take your time doing so. That's not to say there may be other faults (and even the highly positive ones point them out), but it looks leaps and bounds more deserving of a 4.5 or 6.whatever out of 10. Those read as complete jokes to me, especially the one from gamespot. This is pretty much it. The gang on Weekend Confirmed discussed it. Most people haven't played a true survival horror game in years. They're all action games now with touches of survival horror. Last edited by Michael Corvin; 11-19-12 at 06:48 PM. Zombi U looks like Condemned and Dark Souls had a baby. Can't wait to play this! I bet those same critics would complain if a sequel doesn't change the gameplay much. I meant I personally wouldn't assume they put the note in simply because of some bad reviews. Most developers won't touch console horror games anymore unless they are action oriented and/or multi-player. Development costs are getting out of hand and the market for true horror games has shrunk considerably. Maybe they decided to put it in because they were proud of not just going with the rest of the mainstream market. Then again, maybe they wanted to stick it to reviewers. Who knows. This is pretty much it. The gang on Weekend Confirmed discussed it. Most people haven't played a true survival horror game in years. Their all action games now with touches of survival horror. I would argue that Resident Evil Revelations for the 3DS count as true survival horror. Other than that, though, I can't remember one recently. I was thinking of ordering one from WM but the titles games don't look that great. AC is probably the best one there. Last edited by Supermallet; 11-19-12 at 07:14 PM. Yeah, I was just about to say that while I haven't seen any reviews, the impressions I've read from people online have been pretty positive. A good choice, although I do imagine that the online features may be a ghost town, at least for the time being. I don't know what was wrong with me yesterday. I went to a TNA house show Saturday night (freakin' awesome btw, seriously) and got home late and woke up early to get the system, and I was half asleep all day, and I wasn't able to really get too into the system. A lot of that had to do with the transfers and all of the updates I had to do. But today, after I got home from work I fired it up and I was more awake and more able to just enjoy it. I still haven't opened ZombiU, but I've pretty much decided to jump in on it now that I've seen tons of positive impressions, and lots of positive reviews as well. I am so into NSMBU right now, I think it's an awesome SMW inspired Mario game and I love it. I'm also so into the extra features, especially the challenges. Hey Nintendo, put tons of that stuff up for download - I will BUY IT ALL!. People just need to make sure they don't turn the machine off during FW updates. I just read that the machines are bricking and need to be replaced if turned off. It mentions that if you transfer data from your Wii, you actually have to boot into virtual Wii mode to use any of them, and it stretches all the games so you can't get them in the correct aspect ratio. Can anyone confirm this? I'm thinking I'll just move my Wii into my bedroom for the virtual console and Gamecube games I still have, not transfer the data, and either redownload the games one by one onto my Wii U, or wait to see if they offer some kind of upgrade path for when (if) they re-release said games with Gamepad compatibility. Are you able to play the game with the Pro controller instead?